Chocolate Roulade with Raspberry Cream : A Yule Log in the Making. 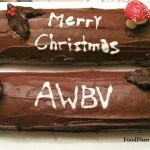 Want a cake to impress, other than a traditional fruit cake, this festive season? Then this cake is it. A beautiful chocolate génoise filled with luscious cream and raspberries, all encased in a layer of thick fudge. It looks fancy but it isn’t hard to do. 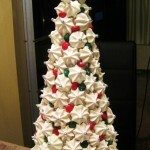 Honing my skill in decorative confectionary, I chose to make this vanilla meringue tower for the last office meeting before they shut for the Christmas season. It wasn’t exactly difficult …. but let’s just say one just needs a healthy dose of patience. 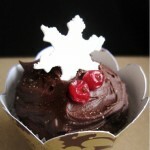 Made these gorgeous dark chocolate fudge cupcakes as part of my Christmas Baking Project. I even made the cupcake covers from scratch. So go on, tap into your Christmas creativity bank now and come up with some beautiful cupcakes of your own. Super quick. Super easy. Full of robust Asian flavours. 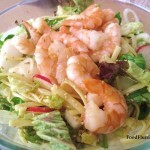 This cold sesame prawn and noodle salad is an excellent choice to have on a sunny summers day with a glass of white. A versatile salad that can be spiced up or mellowed down to suit your personal taste. I love cold prawns and I simply cannot get enough of this salad.